Vatten, brynta oxben¹, grönsaker² (lök, morot), rödvin, tomatpuré, vitlök, lagerblad, svartpeppar. 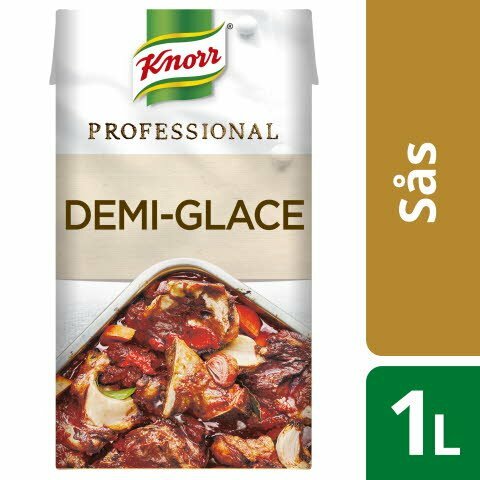 1L Demi Glace är tillagad från i genomsnitt ¹2300 g oxben och ²200 g grönsaker. *Långkokt på köttben och färska grönsaker. Yes: The product contains the specified allergen. * This product contains no intentional the stated allergen, but due to the means of production are shared with other products, or for other reasons, the product may contain allergen. Please note that the laws / serving food to an allergy should always carefully read the ingredient list on the packaging where possible allergens should be clear.